Once again, The Dropper Company will start the new year attending its customers at PCD in Paris, one of the most prestigious, international events in the beauty packaging calendar. Visitors to booth M20 at the event will have the first opportunity to see Virospack's new dropper proposals and its wide range of standard products which are easy to customize to meet a brand's desire for on-shelf differentiation. According to industry experts on the USA's West coast Virospack's Magnetic Dropper is the "best development of the year", as Virospack takes "the best innovation in packaging 2019" award. Setting trends in packaging for skin care and make up, Virospack is presenting high performing droppers for cosmetics on 27th and 28th of February in The Barker Hanger in Los Angeles. Once again, Virospack will start the New Year attending its customers at PCD, one of the most prestigious international shows of the beauty packaging sector. Come to PCD and visit our booth number M20 where we will be presenting the latest innovation in cosmetic droppers: The Virospack magnetic dropper, a new dropper concept which has been completely developed and produced by Virospack. We wish you all a Merry Christmas, Joyeaux Noël, Feliz Navidad, Feliz Natal, Frohe Weihnachten, Buon Natale... Best wishes, and lots of happiness drop by drop. Virospack attended MakeUp in Paris taking place at the Carrousel de Louvre on 22 and 23 June. Virospack will be showcasing a selection of the company's exceptional droppers at LuxePack New York. Come and see us at Booth #C302B on May 10 and 11. Virospack will be present at the 7th Int'l Cosmetics Development Expo this year from January 23rd to 25th. Come visit us in our booth C12-0427 where we will be exhibiting our latest droppers and technology! Virospack will be at this year's Cosmoprof Asia in Hong Kong! Virospack, The Dropper Company, will be exhibiting at the forthcoming Cosmoprof North America. Drop in to Booth #11074 to check out the latest dropper designs and innovations. Virospack will be exhibiting at MakeUp in Paris on June 9th and 10th. Find us at booth D6. On May 11th and 12th, at Pier 92, we will be displaying the latest in cosmetics droppers along with our newest standards. Find us at booth C303. 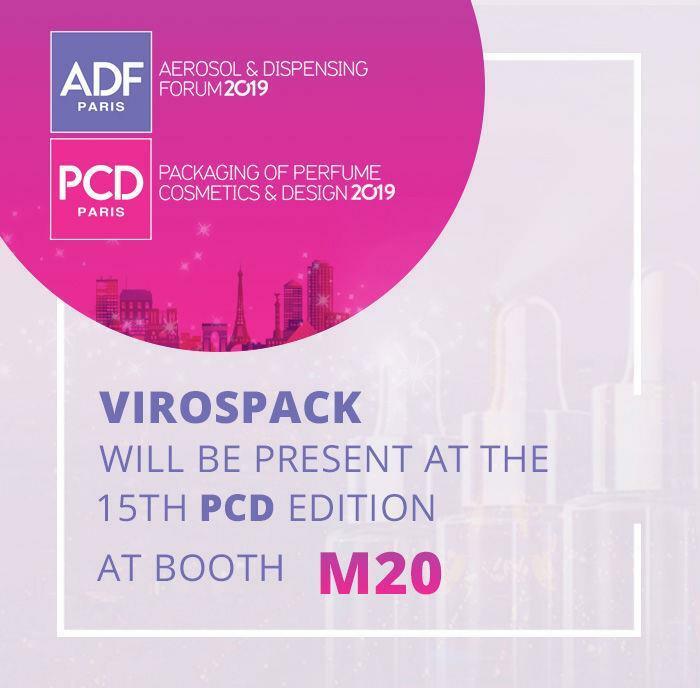 Virospack will be attending the co-events PCD / ADF in Paris next month.